Don’t hide your sin. You’re not fooling anyone. Confess your sin and rejoice in the assurance that God forgives and forgets. And in your gratitude for and confidence in the blood of Jesus, be resolved to sin no more. Count yourselves dead to sin but alive to God in Christ Jesus. Don’t offer yourself or your body to sin. Offer yourself to God as one who has been brought from death to life. Sin is not your master because you are under the grace of our Father. How wonderful to know that when we wake up tomorrow morning it will be the first day of football season! All will be right with the world. Today is the last day of the long football-less summer. This is the last day for the next almost six months I’ll go home and not have a football game to watch on TV. Beautiful. My last football player in the countdown to football season is also one of the best quarterbacks to ever play the game. He was an undrafted free agent out of the University of Washington, where the Huskies ran the ball on over 75% of their plays. But he became the most prolific passer in pro football history and the first black quarterback ever inducted into the Pro Football Hall of Fame. Warren Moon took Washington to a 10-2 record and a Rose Bowl win over Michigan in 1977. But he went undrafted by the NFL. So Moon took off to Canada where he quarterbacked the Edmonton Eskimos to five straight Grey Cup titles and a 9-1 postseason record in six years. The Houston Oilers signed him in 1984 and Moon threw for 3,338 yards that rookie NFL season and then absolutely flourished with the Run and Shoot offense. In 1990 he tied an NFL record with nine 300 yard games. He spent three seasons with the Vikings and then signed with the Seahawks as a 41-year-old in 1997. That season, Moon threw for 3,678 yards and 25 TDs, completed a team-record 313 passes, and went to the Pro Bowl. 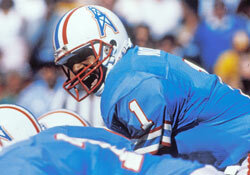 In fact, he appeared in nine Pro Bowls, including eight in a row, a record for any quarterback of any era. He completed his career with the Chiefs in 1999, capping a 23 year run — 17 in the NFL — that landed him in four different football halls of fame. 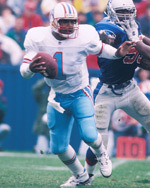 Warren Moon had nine seasons of 3,000 yards passing and four 4,000 yard years. When he retired he was the third leading passer in NFL history and had thrown for the 4th most TDs. But if you combine Moon’s passing yardage in the CFL (21,228) and NFL (49,325) he’s by far the most prolific passer in professional football history. And football season starts tomorrow. Great comments today and thanks for the advice yesterday. Perhaps you could bestow more of your wisdom upon me as we relax by your pool. Allan, get ready, I’m coming home. I look forward to getting to know you. Bring it, brother! I’ve heard tons about you (mostly good)and I can’t wait. Tonight…7pm….LSU @ Mississippi State! Ah, SEC football is the best! I think my kids may be going to bed at 6:59 in order for me to not miss the kick-off!